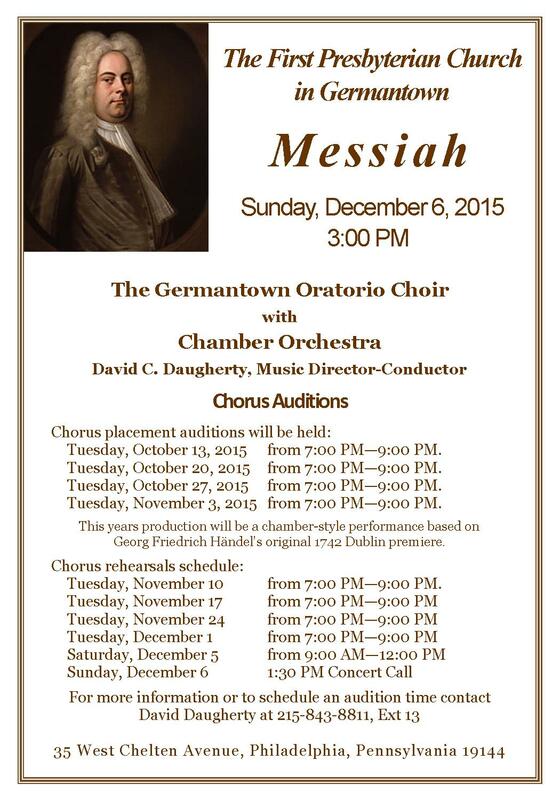 Messiah rehearsals begin Tuesday, Oct. 31, at 7:30 p.m. Please join us on Sunday, October 1 at 4 p.m. for a Song Recital to inaugurate the Barbara Russell Memorial Piano in the Jennings Room. Evelyn Santiago, soprano; Margaret Mezzacappa, mezzo soprano; and Ted W. Barr, piano, will present a program of sacred songs, opera, and musical theater. The performance is free and open to the public. A free-will offering is requested. The annual First Presbyterian Church in Germantown picnic/barbecue sponsored by the Congregational Development and Fellowship Committee (CDFC) will take place, rain or shine, after worship on Sunday, September 24. Members and friends of First Church are invited to contribute a side dish, salad or another choice, fruit, and/or dessert item, ready for serving for this event. The Christian Education Committee will again provide the fun activities. 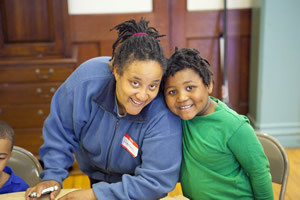 Please see Delores Solomon, Chair of CDFC, or any member of the committee to volunteer. Especially needed are volunteers to grill hot dogs (beef) and burgers (beef, turkey and vegan). We are excited to announce expanded opportunities for youth and adults to participate in the music ministry of First Church. Sing to the Lord a new song! The Gospel Choir, led by Sara Carter-Blanford, rehearses on Thursdays at 6:30 p.m. in the Sanctuary, and sings during worship on the first Sunday of each month. For more information or to participate, e-mail [email protected]. A new Children’s Choir, led by Evelyn Santiago, rehearses on Thursdays at 6:30 p.m. in the Choir Room, beginning Sept. 14. For information or to participate, please e-mail [email protected]. Voices in Bronze, our handbell choir led by Evelyn Santiago, rehearses on Thursdays at 7:45 p.m. in the Choir Room, beginning Sept. 14. For information or to participate, please e-mail [email protected]. The Chancel Choir meets on Sundays at 9 a.m. to warm up and rehearses following worship from 11:30-12:30 in the Choir Room. For more information or to participate, e-mail [email protected]. The Germantown Oratorio Choir, our community concert choir, will rehearse on Tuesday evenings in the Sanctuary from 7:30-9 p.m., beginning Oct. 31. The first concert will be Handel’s Messiah on Sunday, Dec. 3, at 4 p.m. A second concert, the Brahms Requiem, is planned for Sunday, March 18, 2018. For more information or to participate, e-mail [email protected]. The Linda Leube Memorial Concert Piano will be dedicated during worship on Sunday, October 23. An inaugural piano recital will be planned in the spring. The annual FPCG barbecue sponsored by the Congregational Development and Fellowship Committee (CDFC) will take place, rain or shine, after worship on next Sunday, September 11th. Members and friends of First Church are invited to contribute a side dish, salad or another choice, fruit, and/or dessert item, ready for serving for this event. 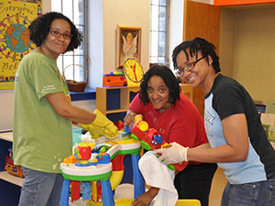 The Christian Education Committee will again provide the fun activities. Please see Delores Solomon, Chair of CDFC or any member of the Committee for help. The 2016-2017 FPCG choir season begins in September. If you would like to express your faith through music, please think about finding a place for yourself in one of our choirs. 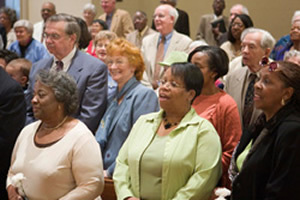 The FPCG Gospel Choir, led by Sara Carter-Branford, will resume Thursday evening rehearsals on August 25 at 6:30. The choir will sing in worship on Sunday, September 4, and on the first Sunday of each month thereafter through June. For information or to participate, e-mail [email protected]. The Chancel Choir will have a special rehearsal on Saturday, September 10, from 1-3 p.m., and will return to singing weekly in worship on Sunday, September 11. 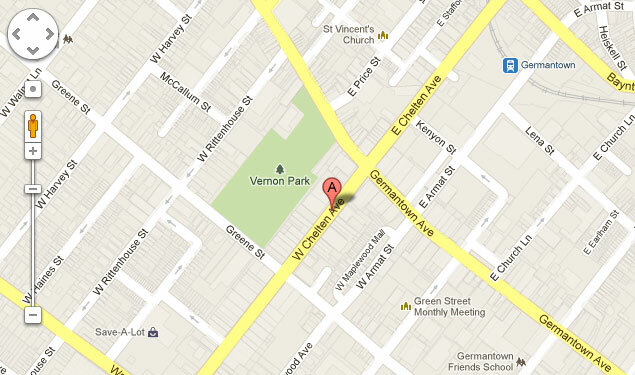 The Chancel Choir will meet at 9 a.m. on Sundays mornings and will rehearse from 11:30-12:30 following worship. The Oratorio Choir will rehearse on Wednesday evenings in November from 7:30-9 p.m. in preparation for the Messiah concert on Sunday, December 4. For more information or to participate, e-mail [email protected]. 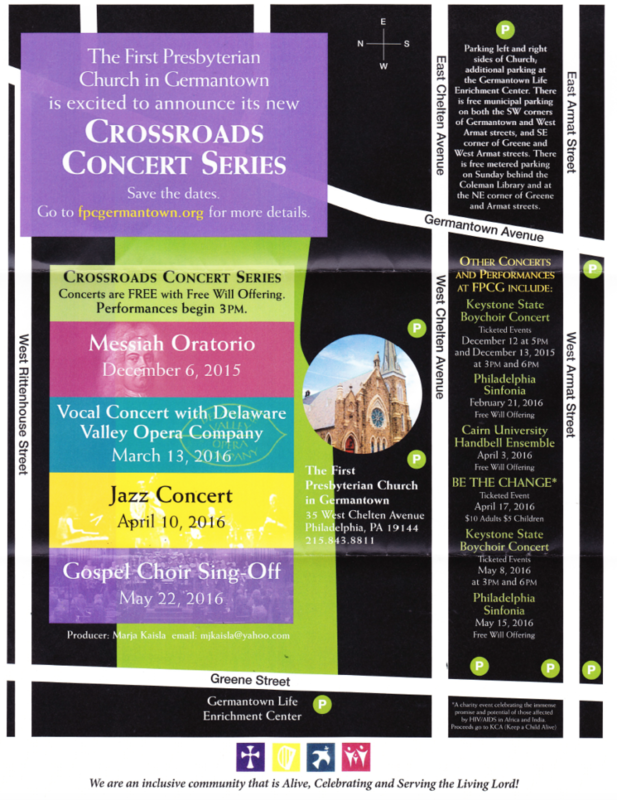 First Pres is excited to announce our new Crossroads Concert Series. Concerts are FREE with free will offering taken. Performances begin at 3pm. We hope you will join us! 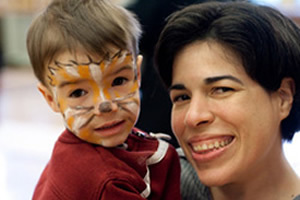 Want to find out what is happening at First Pres? 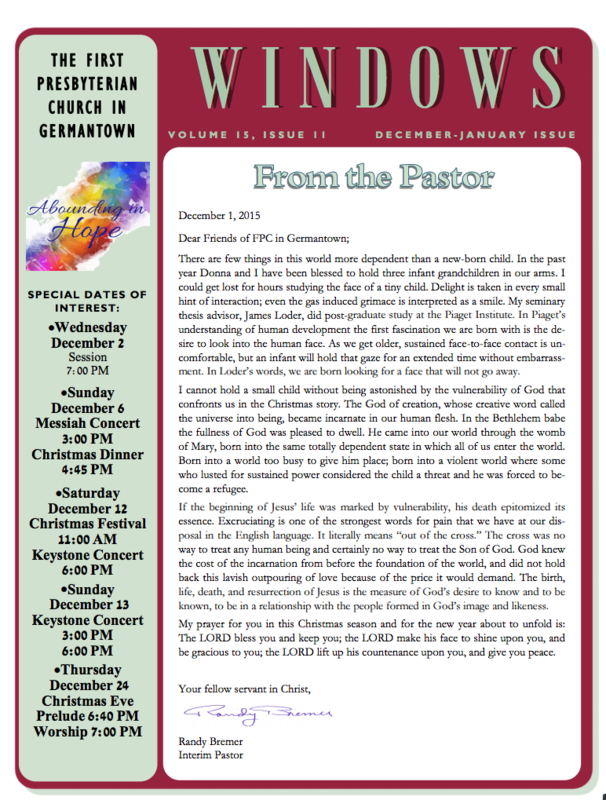 Download our latest church newsletter!